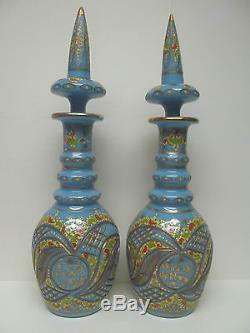 PAIR BOHEMIAN TURQUOISE CUT AND ENAMELED OPALINE/GLASS DECANTERS AND STOPPERS. Decanter with led Dimensions: 19/5 tall x 6 wide. 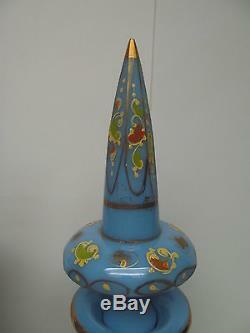 Decanter without led Dimensions: 12/5 tall. 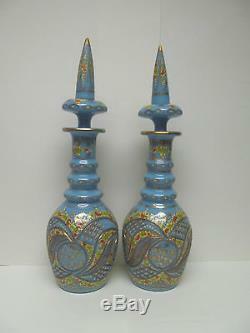 Cut with leaf-shaped panels and enameled with flowers prays and scrolls, heightened in gilt, the neck. 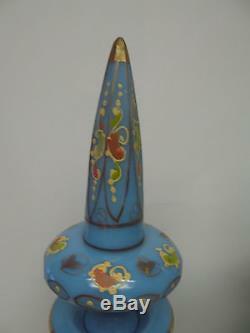 Applied with three faceted neck rings, with spire stopper. In excellent condition, no chips, cracks, repairs, etc. 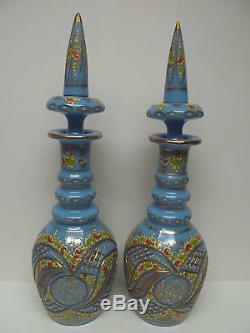 The item "TWO BOHEMIAN TURQUOISE CUT AND ENAMELLED OPALINE/GLASS DECANTERS AND STOPPERS" is in sale since Monday, March 28, 2016. 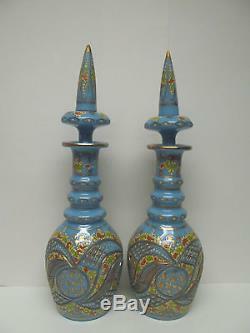 This item is in the category "Collectibles\Tobacciana\Hookahs". 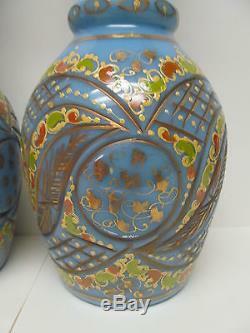 The seller is "chozo51" and is located in Houston, Texas. This item can be shipped to United States, to Canada, DK, RO, SK, BG, CZ, FI, HU, LV, LT, EE, to Australia, GR, SI, to Taiwan, TH, to France, to Germany, to Austria, HR, MY, CO.